An immense impact crater lies beneath the site in the Yucatan Peninsula. The blast, which took place 65 million years ago, heralded the end of the Cretaceous Period. 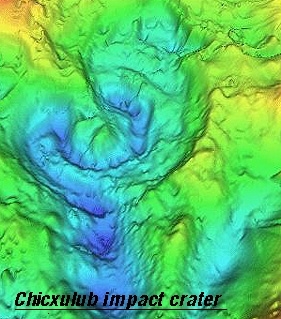 The Chicxulub Impact Event. More than three-quarters of the plant and animal species on the planet did not survive the transition to the Tertiary Period, when mammals replaced dinosaurs as the dominant species. The collision unleashed an estimated 10 billion times more energy than did the atomic bombs dropped on Japan, the scientists said. Wildfires cover the Earth. Some debris concentrated around the impact site and more drifted westward over the spinning Earth and concentrated on the opposite side around India, the researchers said. 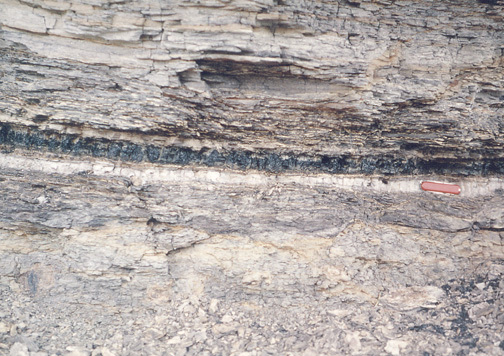 Rocks deposited during the Cretaceous Period and Tertiary Period are separated by a thin clay layer that is visible at several sites around the world. A team of scientists led by Luis Alvarez (a Nobel Prize-winning physicist) and his son Walter (a geologist) discovered that the clay layer contains a strikingly high concentration of iridium, an element that is much more common in meteorites than in Earth's crustal rocks. Like meteorites, asteroids and comets also have relatively large abundances of iridium. Consequently, they proposed that an impacting asteroid or comet hit the Earth, generating the iridium anomaly, and causing the mass extinction event. The discovery of high iridium concentrations in the clay layer at several places around the world suggested the impact was a large one. The dust from the ejecta and global wildfires eventually fell back to Earth, forming part of the global clay layer that marks the end of the Cretaceous period. 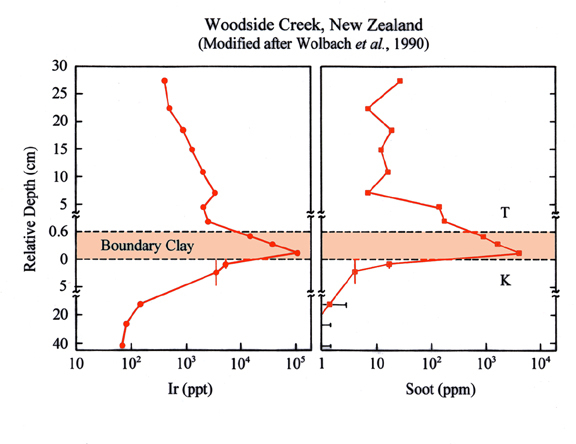 The diagram below shows the coincidence of Iridium concentration and soot concentration in the clay layer.